Nestled in a valley that flows to the great Pacific Ocean, is a rustic beach house perched above the driftwood and dunes; a paradise complete with the flora and fauna of the woodland and shore, including coyote, wild turkeys, deer, elk, whales, seal, and, flying overhead, an array of blue heron, pelican, shore birds and bald eagles. This lovely beach cottage affords the opportunity to explore the many wonders of beachfront living, with huge windows to capture a view that is in constant flux. You’ll have the best seat in the house to watch wave crests ripped by the wind, storm clouds gathering in the distance, and the sun melting into the sea. It’s cozy in winter chill and refreshingly casual in summer months. Gone is the reference to a clock or imposed deadline. Instead, the daily rhythm of the tide sets the pace for activities and adventures. The pristine beach is renewed and refreshed every morning. Imagine beach combing; the tide pools, sea stars, clamming, surf fishing, longs walks, and sand castles to be imagined. 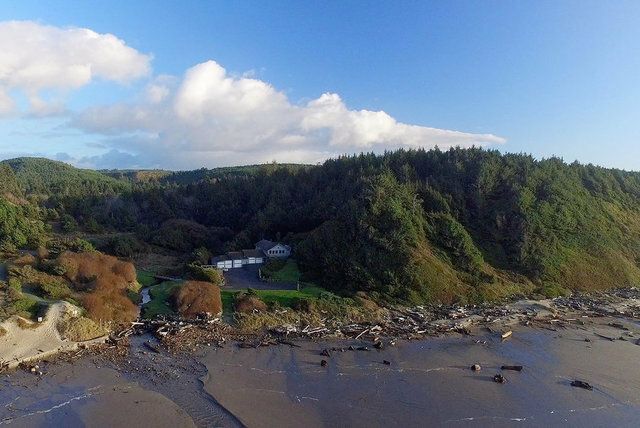 This secluded paradise rests in an exclusive, gated community, yet is only a 15 minute drive to Bandon’s shopping, restaurants, galleries, crabbing at the harbor docks, and salmon fishing on the Coquille River. Thinking of changing your lifestyle? Leave the traffic behind and come to the southern Oregon coast. Come to Bandon and take a break from the stresses of everyday life, here, on this beach, where you can walk from your front door right down to your own stretch of shoreline. What a terrific place for the kids and grandkids. What a terrific place for someone of any age. There’s nothing better, after a morning of golf at nearby Bandon Dunes Resort or an afternoon of salmon fishing, coming home to this, life as you might have imagined.